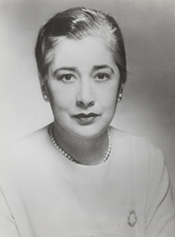 Edna Flannery Kelly, a 20–year veteran of the U.S. House and the first woman to represent Brooklyn, New York, in Congress, made her mark on the Foreign Affairs Committee supporting a broad sweep of American Cold War policies ranging from the creation of the North Atlantic Treaty Organization (NATO) to intervention in the Vietnamese civil war. As chair of the Subcommittee on Europe, Congresswoman Kelly took a hard–line approach to America’s rivals in the Kremlin and in Soviet–sponsored regimes throughout the world. Edna Patricia Kathleen Flannery was born on August 20, 1906, in East Hampton, Long Island, New York, the youngest of five daughters raised by Patrick Joseph Flannery, a horticulturalist, and Mary Ellen McCarthy Flannery. Edna Flannery graduated from East Hampton High School in 1924 and, in 1928, received a B.A. in history and economics from Hunter College in New York City. In the fall of 1928, Edna Flannery married Edward Leo Kelly, a Brooklyn lawyer. The couple raised two children, William and Maura. In January 1942, New York Governor Herbert Lehman appointed Edward Kelly as a judge on the New York City court. Less than eight months later, however, Kelly was killed in an automobile accident. Only after her husband’s death did Edna Kelly seriously consider a career in politics. She had a powerful ally in Irwin Steingut, then the minority leader in the New York Assembly and Brooklyn’s political boss. Steingut encouraged her to become active in local political organizations.1 She reorganized the women’s auxiliary of the ailing Madison Democratic Club and served as a research director for the New York state legislature from 1943 until 1949.2 In 1944 she was elected to three terms on the Democratic executive committee of Kings County, New York, and joined Steingut as a co–leader of the 18th assembly district. Kelly’s lasting contributions came in international affairs. Her first vote in Congress was in favor of a bill in early 1950 to increase aid to South Korea. It failed by one vote, and Kelly recalled John McCormack of Massachusetts lamenting, “We’re going to resent this vote.”10 Later that year, North Korean communists invaded South Korea. Kelly soon established herself as an implacable foe of communism. In the summer of 1955, she visited the ongoing Geneva Peace talks—the first Soviet–Atlantic Alliance summit of the Cold War—culminating with a great power meeting that included President Dwight Eisenhower, Soviet Premier Nikolai Bulganin, British Prime Minister Anthony Eden, and French President Edgar Faure. In the midst of the conference, Kelly confronted Secretary of State John Foster Dulles about revelations of massive Russian weapons shipments to Middle Eastern countries. “Mr. Secretary, you leave this ministers’ conference and tell the world what the Russians are doing,” she demanded. Dulles, no friend of Moscow, answered curtly, “Edna, you want war?” Kelly replied, “You’re going to get war if you don’t do it.”11 On the home front, she supported the House Committee on Un–American Activities, arguing that it “performed good service.”12 Among her legislative achievements was her successful amendment to President Truman’s 1952 bill requesting $7.9 billion in foreign aid, suspending funding to Communist Yugoslavia. The House also approved her amendment to the Agricultural Trade Development and Assistance Act of 1954, which outlawed the sale of surplus commodities to the Soviet Union or its satellites. When Kelly retired in January 1969, Representative Mel Laird, a Wisconsin Republican and Secretary–Designate of Defense, observed that the Congresswoman’s personal “strength” contributed to America “being strong and being prepared and being willing to stand up and be counted when the chips were down in vital areas of the world.”24 Kelly returned to her home in the Crown Heights section of Brooklyn and helped coordinate a Library of Congress oral history project with former U.S. Representatives. Residing in Brooklyn until 1981, Kelly suffered a stroke and moved to Alexandria, Virginia, to live with her daughter. She died there on December 14, 1997. 1Current Biography, 1950 (New York: H.W. Wilson and Company, 1950): 290. 3Edna Kelly, Oral History Interview, U.S. Association of Former Members of Congress (hereinafter cited as USAFMOC), Manuscript Room, Library of Congress, Washington, D.C.: 1. 4“Mrs. Kelly’s Program,” 7 October 1949, New York Times: 21. 5“On Her Way to Congress,” 3 December 1949, Cue; also cited in Marcy Kaptur’s, Women of Congress: A Twentieth–Century Odyssey (Washington, D.C.: Congressional Quarterly Press, 1996). 6“Brooklyn Woman Sent to Congress,” 9 November 1949, New York Times: 7; “Election Statistics, 1920 to Present,” http://clerk.house.gov/member_info/electionInfo/index.aspx. 7Martin Weil, “Edna F. Kelly Dies at 91; Longtime Member of Congress,” 17 December 1997, Washington Post: C6. 8Kelly, Oral History Interview, USAFMOC: 2. 13William M. Farrell, “Mrs. Kelly and G.O.P. Rival Split Sharply Over Red China,” 22 October 1954, New York Times: 18; Edith Evans Ashbury, “Mrs. Kelly in the 10th District Won in ’54 by 50,000 Votes,” 26 October 1956, New York Times: 22. 14“Election Statistics, 1920 to Present,” http://clerk.house.gov/member_info/electionInfo/index.aspx; Kelly, Oral History Interview, USAFMOC: 52–53. 15See Martha Griffiths, Oral History Interview, 29 October 1979, USAFMOC, Manuscript Room, Library of Congress, Washington, D.C.: 155. 16Griffiths, Oral History Interview, USAFMOC: 155–156. 17Kelly, Oral History Interview, USAFMOC: 7–9; 12–13. 18Elizabeth Shelton, “Rep. Kelly Says Threats Helped Defeat Her,” 10 October 1966, Washington Post: C3. 19“Reform Democrats Plan Brooklyn Bid for House Seat,” 12 February 1964, New York Times: 21. 20Richard Reeves, “Brooklyn Contests Aim at Jewish Vote,” 12 June 1966, New York Times: 55; Warren Weaver, Jr., “House Contests Shake Democrats,” 30 June 1966, New York Times: 25; Alfred E. Clarke, “Edna Kelly Vote Upheld By Court,” 26 August 1966, New York Times: 21. 21“Election Statistics, 1920 to Present,” http://clerk.house.gov/member_info/electionInfo/index.aspx; Edward Hudson, “Two Leftists Among Mrs. Kelly’s Rivals in the 12th,” 26 October 1966, New York Times: 51. 22Richard L. Strout, “Mrs. Kelly of Flatbush,” 26 May 1967, Christian Science Monitor: 18. 23Elizabeth Shelton, “Rep. Kelly Says Threats Helped Defeat Her,” 10 October 1968, Washington Post: C3. Papers: In the Pluma Burroughs Penton Batten Papers, ca. 1948-1964, 5.25 linear feet. Subjects covered include Edna Flannery Kelly. "Edna Flannery Kelly" in Women in Congress, 1917-2006. Prepared under the direction of the Committee on House Administration by the Office of History & Preservation, U.S. House of Representatives. Washington: Government Printing Office, 2006.